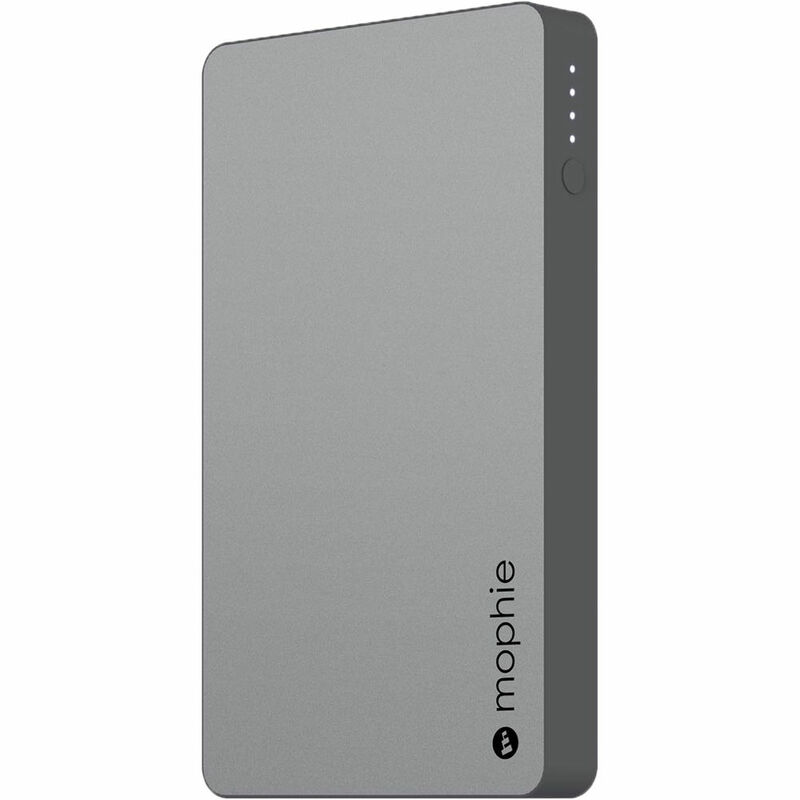 Recharge your mobile devices with the gray powerstation with Lightning Connector 5050mAh Battery Pack from mophie. This compact and portable power solution features a single Lightning connector, so you can charge an iPhone or iPad directly with your Lightning charging cable. Additionally, this power bank has dual USB Type-A charging ports, which allow you to charge up to two USB-equipped mobile devices simultaneously. Between both ports, your devices will enjoy up to 10W of fast-charge power and 5W of steady power respectively. The powerstation also utilizes Priority+ pass-through charging technology, so your connected devices will be recharged before the battery refills itself. Moreover, this power bank has four LED status indicators, which provide information on both the current charging status and battery level. Aside from minimizing clutter with its multifunctional design, the powerstation is built for durability thanks to its aluminum finish. This 5050mAh portable battery provides hours of power for your Apple devices: over 20 hours for iPhone X, over 7 hours for iPad mini 4, or over 4 hours for 10.5" iPads. With two USB Type-A ports, the powerstation portable battery lets you charge two USB-compatible devices at once at fast speeds. Use the fast-charging 10W USB Type-A port to charge one device and the steady 5W Type-A port to charge another simultaneously. The powerstation portable battery has been designed to work specifically with Apple products. All you need to recharge the powerstation is the Lightning cable that came with your Apple device. Connect the powerstation portable battery to a wall adapter in the evening, and pass-through charging will send power to a connected device first; then, recharge the powerstation battery so both are fully charged when you wake up. The battery pack comes in a gray, aluminum finish, making it a suitable and stylish accessory for any mobile lifestyle. Box Dimensions (LxWxH) 7.0 x 4.2 x 1.2"